Though it is known as “the pink city“, Jaipur’s facades are more amber-colored. But within the walls of Rajasthan’s much loved capital, you’ll certainly enjoy a “la vie en rose” kind of week-end. Majesty beyond your imagination, eye candy jewels and hidden gems to fall in love with… This is India, romantic India, magical and splendid. This magnificent yet simple family-run B&B is housed in a Maharaja's ancient garden property surrounded by sweet scented jasmine flowers. Mr Gujar tastefully decorated the rooms and living spaces with antiques, and you’ll be able to shop some items if you’re too lazy to hunt at the flea market. Just saying. ASK: For the Indian breakfast. Never had such delicious paratha. And for the Hindustan Ambassador famous car to drive around with style. Now if you like spending your mornings rummaging around, the Hatwara Flea Market’s for you. That’s where you’ll find traditional Lassi glasses, vintage scissors, old photographs of Indian idols… The bustling Phool Mandi wholesale Flower Market is adjacent to it. One of Jaipur’s symbols, Hawa Mahal or Palace of Winds was built in 1799 by poet King Pratap Singh. Its 953 latticed windows are quite impressive. Whereas The Royal Family still resides in the 18th century City Palace, they have opened up their homes to host a Museum. From the 18th century Nahargarh Fort or Tiger fort, you’ll enjoy stunning views of the city. Whilst Amber Fort is the iconic palace of India, its 16th century walls snaking away into the horizon could be the Indian counterpart of the great wall of China. Situated in Amber Village, this museum housed in a beautiful restored haveli, outlines the story of the famous textiles with hand block printing demonstrations. After an italian meal or a drink at the stylish Bar Palladio, head over to Hot Pink, a shop by Gem Palace’s owner Munnu Kasliwaland and French jewellery designer Marie-Hélène de Taillac. Their collections are outstanding, and the place itself is worth a visit. Follow the path of the Royal families, Hollywood and Bollywood stars and window shop in this institution established in 1852. Their hand-poured soy wax candles are a must-buy. They come in round marble containers with cedar wood wicks. The cardamom, saffron & vanilla fragrance is incredible. For the renowned glazed pottery of Jaipur. Contemporary style gifts made by Indian artisans. Jewellery, clothes, lifestyle. Located in the beautiful gardens of the Rambagh Palace Hotel, the Verandah Cafe serves the most delightful Thali in the most romantic setting. If you’re more into the typical local atmosphere, LMB offers authentic Rajasthani vegetarian cuisine. Don’t forget to try everything at their sweet shop. How about a visit to “Ha Long Bay”. Not the usual one. Let’s go a bit far from the sea and closer to earth, where limestone mountains give way to endless rice fields and rivers. Where you can cycle for hours and find shelter in shacks tucked in the silent and stunning countryside. And how about a pit stop in Hanoi, to grab one of those delicious Banh Mi or just stay a little longer at the house of an artist and savour vietnamese hospitality. This incredible hotel situated in the middle of a valley offers an ecotourism kind of experience. A friendly team will make sure your “Bamboo bungalow off the beaten track” is well heated. Or that you have enough blankets at night (It can get really cold during winters and this is glamping…). Their biking tour is worth the go. Toan, one of the managers will guide you through small villages, a hidden pagoda and landscapes that will unfortunately be transformed into modern residential areas in a few years. The Huang Mua temple is just about 10 minutes walk (+ 15 minutes climbing to the summit) and gives an ideal view of Tam Coc. ASK: For their banana flower and chicken salad. The menu is mouthwatering and you’ll preferably eat at their restaurant, as there’s nothing nearby. Known as the terrestrial Ha Long Bay, this is where you’ll embark for a 1h30 small boat excursion along the Ngo Dong river. Beautiful Tam Coc, (unlike some parts of Trang An) is a natural cave site, where the National Liberation Front army used to hide during the Vietnam war. Hanoi is about 2 hours drive from Tam Coc. And a 4 seat private car should cost around 70 USD. Crispy french baguette with handmade pâté, barbecue pork, fresh vegetables and a family secret sauce recipe. This stall made its reputation by selling one of, if not The best Banh Mi in town. Tasty, authentic and affordable street food. ASK: Well you don’t need to ask, tea and bananas come for free. Chef Didier Corlou’s restaurant is a dedication to his wife’s grandmother and “to all Vietnamese women of the past and the present”. The result is divine cuisine. Before it became “Madame Hien”, this mid-19th century home of Hanoi’s Opera architect, later welcomed Ho Chi Min. If you like houses full of stories, his other restaurant “la porte d’Annam” is a former presbytery once visited by Mother Teresa. ASK: For the “Nam cuon tom va xoai” (Mango salsa with prawn, fresh spring roll), their specialty. This very very hidden gem is home to Mr Le Hong Thai, a Vietnamese painter who takes really good care of his Zen garden and has been gathering antiques throughout the years. HIs beautiful eurasian style house is a peaceful homestay, and Mr Thai will kindly light the fireplace to keep you warm. Should you prefer to stay in the center of old Hanoi, “La Maison d’Orient” is a lovely boutique hotel with a good “Pho” soup breakfast. First, there’s a striking beautiful interior, wooden, minimalist, all in curves. Then the lovely details like the cutlery hidden inside you’re table’s secret drawer. This tastefully designed restaurant has the atmosphere of an art gallery while it’s all about gastronomy. Or “bistronomy” more precisely, meaning affordable gastronomic french style cuisine with a Taiwanese twist. No surprise as it’s been conceptualised by famous “born in Taiwan” and “made in France” Chef André Chiang. Creative and spontaneous, that’s how he and his local team led by Chefs Zor Tang and Alain Huang wanted RAW’s menu to sound like. Highlighting seasonal produce, what comes on your plate carry exciting names like “Uni Hokkaido Peanut Butter Peas”, “Sakura Ebi Cappellini” or “Chocolate Burnt Butter Mochi”. Their daring mantra “Never be afraid to make mistakes” has worked as they don’t seem to have made any. Since they first opened a year ago, Raw has become one of the most sought-after restaurants in Taipei. Rare are the Chefs you’d follow anywhere they settle a business. André is one of them. Singapore, check, Taipei, check, Paris, next. ASK : your way to the restroom, a must-see… Kidding aside, make sure to make your reservation early in advance. If not, you might have a chance on waiting list. Until January 10th they’ll only be serving a “best of the year menu”. Or shall I say get really really hot? 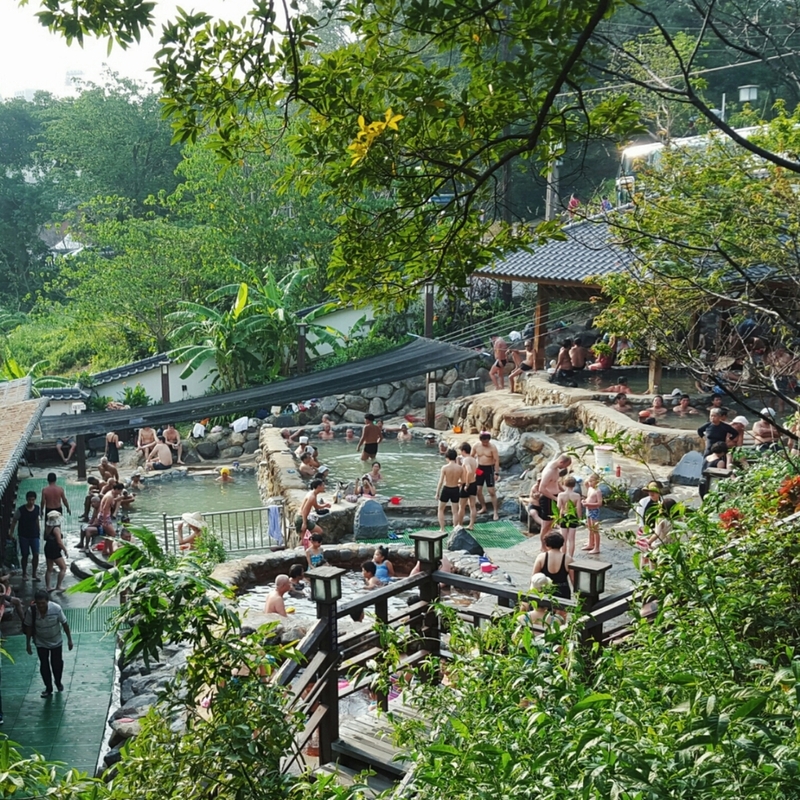 Only 20 minutes away from downtown Taipei, Beitou neighborhood is (not well) known (enough) for its incredible hot springs. Up to 100 degrees Celsius water boiling underground. Much loved by the Japanese who installed public baths during the occupation era, this also former red light district has been revamped and offers quite a few hidden gems. So jump on a scooter taxi (Beitou is the only district in Taipei where you can find some), ride through lush green sceneries, and soak into those hot springs believed to carry healing virtues. Nestled between narrow back lanes and old houses, Solo Singer is a “Slow Life” hotel with a warm feeling. The curators have preserved the original space of what used to be a 1960′s Inn, and kept vintage items from its previous life. Rooms inspired by Virginia Woolf’s A Room of One’s Own were designed by 18 different artists, we can’t thank them enough for having created such unique shelters. Solo Singer is not only a hotel, but a café as well (Solo Singer Life), hosting local and cultural exhibitions. B&B concept has never felt so good, and creative. And in matter of good (food) advices, friendly Heather, Anny & Co would be your best partners in crime. ASK : For a non Japanese room if you’re not used to lying down on a wooden floor with a very (very) thin mattress. On your way to (or on your way back from) Beitou Spring, grab a drink at the Cai Yuan Yi stall. There’s always a little line of people waiting to get one of the best sweet and refreshing black teas in town. Nothing fancy in here, but the place is better maintained than Long Nai Tang (the oldest hotspring in Beitou). There’s a complementary fish spa upstairs and not so cosy private bathing rooms. So I’d recommend to jump into the public ones downstairs for a true local experience. You’ll have to go naked, girls and boys separated of course. If you’re not into hot springs, but more into books and/or architecture, another good reason to go to Beitou is to visit its public “Green” library. Get your hands on one of the few books in English and relax on the open air balcony. In the Hot Spring Park you’ll also find the Hot Spring Museum. Originally built to house Beitou’s first public bath house, this “Taisho Roman” historical monument officially reopened as the city’s hot spring museum. Relics found by the locals before renovation are still displayed in the pool. Architecture lovers here’s another one for you. Take a walk around the Thermal Valley or so called “Hell Valley” where you can watch sulfur water steaming out of a volcano’s crater. If not discouraged, you might want to take another bath. Head to the outdoor Millennium Hot Spring then, where you’re obliged to wear a swimsuit this time. Plunge into various pools which temperatures increase as you get to the top. I confess not being able to stay more than one minute in the 45 °C one. A fun experience though. If you’re looking for something posher, Marshal Zen Garden located next to the Beitou Museum on top of the hills has a wonderful view. Former residence of military leader Marshal Zhang Xueliang, this property now offers fine dining and luxury private hot spring rooms overlooking the valley. But if you only want to get your feet wet, it’s possible. Not quite the same atmosphere, but if you’d rather stay in Beitou’s bustling area, there’s a free public foot bath in Fuxing Park. That would give you the opportunity to stop by North Pole Soft Ice and taste one of Ashin’s (the famous taiwanese lead singer of the rock band Mayday) favorite sweet treats. Whereas most of the restaurants close early in Beitou, Wu opens daily from 12 am to 12 pm. It’s crowded during peak hours but that would be the right moment to go, to mix with the locals. And to meet Kerry, the lady’s whose family have been owning this restaurant since 1980. Indoor or Outdoor, the place is bursting with energy. I have a preference for the outdoor tables, as you can watch the cooks prepare fresh noodles. ASK : For some Wanton as well. In their own style, they’re as good as the beef noodles. Another side of bustling Beitou, the market with its street food and the famous local tempuras. Not to be mistaken with the Japanese ones, the Taiwanese tempuras are more “fish ball” like. From Beitou Market, on your way to A-Jen Bakery, catch a glimpse of what used to be old Beitou on Zhong Zhen Old Street. A bakery helmed by 2 lovely sisters, making delicious Cheesecakes, Tiramisu and must-eat pineapple cakes. This beautiful café located in a renovated barn has a micro coffee roastery. Their delicious cakes are baked in house. ASK : For their homemade Gao Fei coffee to bring back home. The reason that motivated me to visit Kyoto is… a flea market. We all have our silly whims don’t we… And a desire to learn more about old Japan history of course. Cause in Kyoto, once Japan’s Imperial capital, you really do feel like time travelling. So there I went, took my Shinkasen ticket from Tokyo (200 euros for a round trip but it’s worth it) and spent a day only. Although I wish I had more time to explore, the “city of the ten thousand shrines” obviously led me to its marvelous temples. But also to a few good lifestyle surprises, like relaxing in an old coffee-shop with a “Breakfast at Tiffany’s” atmosphere, or eating a delicious japanese style stuffed omelet in a cosmetic brand restaurant. ASK : For the pancakes. Close your eyes, Audrey Hepburn’s voice in your ears, And here’s a free Kyoto-New York ride. The “East guardian temple” was founded when the capital moved to Kyoto in the late 8th century, it’s 5 storied Pagoda is Japan’s tallest and became a symbol of the region as it can be seen from many points across the city. Held inside To-Ji’s grounds on the 21st of each month, Kobo-Ichi Flea Market is one of the region’s largest. Vintage and handicrafts, old cash machine… It would take at least 3 hours to visit all the stalls. But unless you want to revamp your entire apartment you don’t need that much time. Tucked in the middle of south-east mountain trails, Fushimi Inari Taisha (dedicated to “Inari” the Shinto god of rice) is one of Kyoto’s most impressive attractions. Its thousands of orange Torii gates form a tunnel in which you can stroll. Around the sacred area is also where you’ll be able to eat good street food and find traditional souvenirs and gifts. Couple your walk in the magnificent Bamboo Grove with a visit to the Nonomiya Shrine to pray for good love. Then have a lunch break at the Yojiya fine cafe (which is also a famous cosmetic brand from Kyoto), before savouring a green tea ice cream at the Soft & Ice stand. ASK : For the Omu-rice at Yojiya. Which is a stuffed omelet (with fried rice, tiny fishes and tofu), bathing in a Miso broth. And to rent a bike for 1000 yen at the train station if you have time. To cycle through the rural residential areas and between the numerous temples. Zen has never been this beautiful at Kinkakuji or the Golden Pavilion. Overlooking a large pond, this temple covered in gold leaf was home to the Shogun A. Yoshimitsu in the 15th century. Absolutely stunning. ASK : Your way to the tea garden if you fancy a matcha. Kyoto is often related to Geishas, which are related to Gion, the old traditional wooden houses neighborhood where the Ochayas (tea houses) are located. It’s an absolutely charming must-visit. Japanese gastronomic restaurant cluster around Hanami-Koji street and the Shirakawa canal area. It’s very hard to catch a glimpse of a Geisha and you might be fooled by tourists dressed alike. If you care for some shopping, Yojiya’s biggest boutique is on Shijo-Dori. This cosmetic brand founded more than a century ago in Kyoto, is famous for their facial oil blotting paper. Still on Shijo-Dori, Tsujiri offers a large variety choice of tea. Other than that, beautiful Ippodo (also an ancient tea house) is located 20 minutes walk further North- West, just next to a traditional Paper shop (Washi) called Kamiji Kakimoto. If you have an urge for HIpster or Boho lifestyle, head to Mumokuteki (vegetarian and health conscious food) restaurant & Cafe. Also a concept store, vintage or not they have it all. And for a last sweet treat at the train station, make a pit stop at Irodori confectionery store. They make the best triangle-shaped mochi like Yatsuhashi, typical of Kyoto. Fascinating, moving, endearing, puzzling, those words are not enough to describe how amazing Tokyo is. Fall is one of the best seasons to visit, the weather still allows you to take naps in sunny parks under green, golden and red trees. Here, you’ll sometimes feel like you’re on another planet and a bit in France also curiously, as it’s not unusual to see bakeries and boutiques carrying french names (spelled in a funny way). I won’t lie, I spent more than 3 days in Tokyo, incidentally scenic beauty remains on my mind. In my experience, here’s some of the best of what this incredible city has to offer. A 3 day journey as complete as possible. Start the day with an early breakfast at the must-visit Tsukiji Fish market. Stroll unhurriedly around Asakusa (Senso-ji thunder god temple), Ueno Park and Yanaka neighborhood to catch the best of old Tokyo. This place could make the Sashimi addicts collapse. Tsukiji is a market where you’d spend hours. First of all if you choose to eat at the renowned and famous Sushi Dai or Sushi Daiwa you’re likely to literally queue for hours (especially if you go at dawn). But besides, wandering around the stalls, fish or not ( there’s even a cheese boutique) is a must do in Tokyo. For the completely addicts, you can attend the tuna auctions at 5 am. If not, going for breakfast at 8 or 9 is early enough. ASK : your way to Sushi Zanmai to avoid a long queue. Here no translation necessary as you pick plates from a conveyor belt. Spot the “Otoro” the best part of the tuna. A bit more expensive but where else in the world would you eat this quality of fish (fresh off the boat)? Asakusa neighborhood might remind you of some stereotypes seen in classic japanese movies or Miyazaki animation films. Old Tokyo is here, with the souvenir shops in bonus. All of that on you way to the impressive Thunder Gate and the Senso-ji (the city’s most visited temple) surrounded by beautiful little gardens. ASK : This is where to buy Kimonos, Yukatas (the summer version of kimono), flip flops… Those are not so easy to find elsewhere in Tokyo. Ueno Park is simply beautiful and has a lot to offer. Walk around the temples (Tennoji, The five storey pagoda..) and couple your visit with a museum or two, (Tokyo national museum, Tokyo metropolitan art museum or The National Museum of Western Art designed by Le corbusier…) It’s huge, there’s even a Zoo here, and in spring you’d get a perfect picture of Hanami (Cherry Blossom). Yanaka is a must-visit after a walk in Ueno Park. This beautiful neighbourhood that carries the traces of old Edo with its numerous little temples and traditional houses has survived the Great Kanto Earthquake of 1923 and damage from World War II. Its inhabitants have been fighting the disappearance of historic buildings ever since. Here, even the Yanaka Cemetery has got charm. The best way to discover the area is to explore randomly, but you’ll certainly need some breaks, here are 3 eating and chilling landmarks. Mirror ceiling and retro decor coupled with the traditional design of an old kissaten (tea room) give a unique atmosphere to this coffee shop. The place was recently transformed but first opened in 1938 and local people of all ages are regulars. You might wait a tiny bit for lunch but the homemade dishes (2 choices that change everyday) are worth the try. ASK: For the white chocolate and green tea cake. Goes well with the (too?) strong coffee they make. Masami Shiraishi wears two hats, owner of the renowned “SCAI the bathhouse” gallery, (he was one of the firsts to show Takashi Murakami’s work), he also fullfills his passion for food by owning Kayaba Cafe and Kayaba Bakery. Just opened in spring, this little gem shares premises (think wooden houses from early 20th century) with a yoga room, a craft beer bar and an olive oil shop. You’ll essentially find bread here, fougasse type. Nothing Japanese except the fact that they are made by a Japanese Baker. ASK: For the little Olive and cheese bread. On your way renting a bike at “Tokyo Bike Gallery”, you’ll find this lovely boutique selling little antiques, japanese crafts and ceramics. Yanesen neighbourhood doesn’t lack of cute little places but this one has the advantage of combining cafe and shop. Kokonn is located in the epicentre of the old temples area. A great place to chill and relax. ASK: For the green tea matcha french toast or an ice cream from “France dessert”. Start the day with a museum overlooking the city in Roppongi. Then lunch, shopping and dinner in the trendy Omotesando area. A Murakami exhibition runs until march 6th 2016. In the heart of Tokyo, this city observation deck perched on the 52th floor of the Mori Tower is one of Asia’s greatest. First because it’s incredibly cosy (they installed a library and even a Ruinart champagne bar with a glass at 15 euros). If you’re lucky enough (mostly on clear winter days), you’ll catch a sight of mount Fuji. And 2nd because the ticket also gives you access to the very modern Mori (contemporary) Art Museum on the 53rd floor. Within this two floor experience, relax with a coffee at Cafe The Sun and shop some design souvenirs at the museum boutique. ASK : Before or after your visit, Don’t forget to pass by “Maman” the Louise Bourgeois monumental spider sculpture. Maisen… well simply the best tonkatsu I ever ate. Since 1965, they have been serving this deep fried breaded pork cutlets. You can actually get a bit lost with all the varieties on the menu, if so just order the Kurobuta Tonkatsu (black pork), their signature dish. I’ll go for the fillet. You can also opt for the donburi (rice bowl), though the meat is less crunchy. For this unique pork experience, prepare to queue at pick hours. ASK : For the Tonkatsu sauce they sell at their delicatessen. Owner Eiichi Kunitomo, a Barista since 15 years, revamped a 1950 japanese home into a tastefully minimalist styled espresso and coffee kiosk. Zip the delicious coffee on a bench in their tiny tiny garden. If Omotesando Koffee is too crowded, The Airstream Garden garden nearby is a good alternative. Opposite Decor and atmosphere though. Choose to have your coffee inside or outside a trailer. Nomad american philosophy in Tokyo, why not! Still have some room for dessert after Maisen? une crêpe chez Breizh then? This french institution has actually opened its first outlet in Tokyo in the 90’s first. ASK : For the crêpe suzette or how not to feel guilty eating alcohol. Around the metro Meijijingu-Mae, start shopping at Laforet Harajuku. This multy-level department store gathers brands by japanese designers mainly. Eccentric fashion but not only. It’s gigantic, so you might need to take a break at some of their indoor cafes. Continue towards Chicago for vintage kimonos, dresses and jeans. Then wander around Shibuya Cat, the trendy street where you’ll find the concept store United arrows (for high quality lifestyle as they say), W Closet for women casual, and Brand my star or Ragtag for other vintage hunting (more likely luxury brands this time). ASK : Your way to Ray Cassin & Germe my favs for girls at Laforet. A Tokyo foodista experience wouldn’t be complete without a stopover at a ramen vending machine. Here they have unusual ramen varieties. ASK : for the pork and lemon ramen, dreaming of it right now. Start with a Boho brunch at the Farmer’s market (weekend only), drop by the Pool Aoyama on your way to the magnificent Nezu Museum. Bath like a japanese at Shimizu Yu Onsen and fill your stomach at Itasoba Kaoriya to finish the day. This market pops up every weekend from 10am to 4pm. Around 60 smallholders from all over the country gather to sell their organic and pesticide free products. Love the food trucks. You’ll also be able to find ceramics and other handicraft gems, and japanese stalls with french names (of course). ASK : to taste everything, this is foodie paradise. This place is a delight to the eyes. An ancient pool in a 1970’s apartment block converted into a boutique. Men’s streetwear mostly. Calligraphy, painting, sculpture… Nezu Museum hosts an important collection of japanese and asian pre-modern art. 7 items have been designated as National Treasures. This former home to a wealthy industrialist collectionner is also worth the go for its coffee shop overlooking a beautiful garden. Minimalist design embraces traditional Japan. Architect Kuma Kengo’s intention was to create an experience of Wa, that stands for harmony. ASK : For the cake of the day after a look at the outstanding pieces of art. Checking the museum’s boutique might also be useful to bring some presents back home. Bathing naked with strangers might sound like a funny thing to do… But sinking into japanese hot springs (believed to have healing powers) is an incredible experience if you’re not too shy to do so. Shimizu Yu Onsen is not far from downtown, and features indoor baths and an outdoor bath with water with a different mineral composition and temperatures (a gold one and a black one). How delightful to relax on the long chairs outside after bath. ASK : to rent towels or buy soap at the reception if you’re not bringing yours. And be careful to follow the whole protocol before bathing. Time has seemed to stop in this chic noodle canteen. All wooden and simple, this Soba paradise located near Ebisu MRT is a hideaway from bustling Tokyo. And everything is about details, like the peanut that serves as a chopstick holder. ASK : for the soba with the sesame dipping. Dreaming of it right now. And for the “Soba you” (the hot water used to boil the noodles). Poured into the rest of your dipping it’s now a broth for you to drink. Hotels in Tokyo are expensive, so unless you’re willing to stay in something not so tastefully designed or pay for a Palace downtown, here’s an alternative : Claska. Located within 10 minutes walk from Gakugeidaiku MRT in Meguro, this 1969 building was converted in 2003 into Tokyo’s first boutique hotel, contemporary with a japanese twist. ASK : For a DIY room. Handmade by a japanese designer, from construction to design. (around 110 euros for a double). ONE LUNCH ONLY OR TEA TIME ? If you had time for only one lunch in Tokyo, besides going for Tonkatsu at Maisen, I’d recommend Higashiya in Ginza. For a refined lunch in a modern style tea house. Part a confectionery shop, the atmosphere here is so serene you could levitate. The typical menu (less than 30 euros) includes 2 types of tea, 2 starters, a main dish, brown or white rice, pickles, miso soup and a wagashi (the famous japanese confectionery). Products are seasonal here, meaning you won’t enjoy a strawberry mochi in november but most likely a candied persimmon. ASK : for what alcohol goes best with your wagashi if you’re not too “tea”. Surrounded by a peaceful garden, this brasserie bistronomique for lunch or brasserie gastronomique for dinner would fulfill a french meal desire. Jean-Jacques Garnier, director of the french institute has put all his heart in creating a great menu with Chef Yujiro Kaneko. Here’s “scallop pudding”, “Terrine” or Kaburi beef in shallot sauce for you. Many specialities with fish as well. Plus, l’Institut Français is only a 100 metres away from Kagurazaka, known as Tokyo’s french neighborhood. ASK : For the Pain Perdu (French toast), it’s Jean-Jacques’s “péché mignon”. Other desserts like the Mont Blanc are also worth the go. Closed on Mondays. Sundays lunch only. Located in the colorful gay neighborhood of Nichome/Shinjuku, this is certainly a place where you’ll have fun. Around since 1966, This little disco is a classic now. If you’re looking for something more sober, there’s always the Lost in Translation New York Bar at Park Hyatt…. New Delhi is not new at all. Sprawling ruins of dynasties intrude on the modern side of the city and surprisingly appear in gardens and at every corner. Making it a fascinating necropolis. It’s not like you can choose between New or Old Delhi, India’s capital has somehow continually evolved keeping track of its past. To our great delight, history is everywhere. Delhi was also home to Gandhi , the “father of the nation” who had spent his last days in the Birla house before he was assassinated. So Delhi green city, historical Delhi, lifestyle Delhi, you can experience those all at once. Here’s where you’ll feel the beating heart of trendy and old Delhi. The main road is filled with restaurants and bars, surrounded by medieval history, a madrasa and a 13th century water reservoir. At Social, part a work space, a café restaurant and a night club (helmed by famous bollywood DJs), you’ll be overlooking the historic side from the terrace. And sipping a cocktail on old hospital beds converted into cosy dining tables. How unlikely. ASK: For some tandoori to go with your drink, the paneer is simply delicious. Could be an alternative to Indian food. Mainly a cool and cooling tastefully designed place to rest and chill. ASK: for the salads, the sandwiches were disappointing. Paintings, old books, Maps, Prints and movie posters, this little shop has it all and has been in this location for more than 26 years. ASK: to meet endeering Mrs Kusum Jain. She has great anecdotes to tell. Among them, how she shook former Czechoslovakia’s President Vaclav Havel’s hand. For more than 40 years, The Shop has been selling Indian handicrafts at reasonable price. Beautiful homewares, textiles and clothes sourced from NGO’s. I’m a particular fan of their nightgowns. A taxi driver told me about this place. Saying you could find the best Masala tea in town. If you don’t know how to boil Masala tea properly, no panic they sell teabags. Once back home, time travel to India by simply adding milk to the infusion, Masala Chai here you go! ASK: For the Darjeeling, an affordable classic. A French concept store boudoir in the heart of Shapur Jat? A brilliant idea by Catherine Prakash and Lucie Salaun. Tucked in a 1930’s haveli (private mansion), the boutique curates their home brand homeware and fashion, Parisian brands like Laurence Doligé and Petite Mendigote at very reasonnable price (cheaper than France). Enjoy pasta, salads, quiches, cakes or crêpes at their lovely café. A desire to wear traditional textile but a bit scared to look ridiculously “Indian wannabe”? Humm no worries, head to Anokhi. Affordable, modern yet exotic (just enough but not too much) this fashion and homeware brand has been environmental friendly for more than 40 years. This store is not only about books, it’s about paper. Handmade paper products. And it’s been going on, father & son for more than 50 years. The gift cards are lovely. Ok here’s the thing, Delhi is not considered a safe city. Getting lost in the narrow lanes especially when it’s dark can be a bit dodgy. That’s what happened to us after diner at Karim’s. But let’s get back to cheerful food… Karim is not a fancy place, nor charming nor cosy. But it’s Delhi’s iconic place for Kebab. And it’s in the middle of Old Delhi, where it’s very interesting to go to when you don’t get lost at night. ASK: for the butter chicken. So tasty. Two in one go. After a visit to the Crafts Museum (don’t forget to check out their shop), find shelter in Café Lota’s patio. The indian dishes are absolutely delicious and can be healthy too. With a preference for the “dal ka chilla”, lentil crêpes, tempered spinach and cottage cheese. ASK: For the kumaoni raita, cucumber yoghurt flavored with mustard seed. It’s a drink! The owners of Café Lota transformed the intellectuals much loved “Triveni tea terrace”, into “Triveni Terrace Cafe”. A place where artists and thinkers still gather as it is nestled in Triveni Kala Sangam, a cultural and dance complex since 1950, which contains 4 art galleries. The Aloo Tikki Chaat, a traditional snack was amazing. ASK: to order the special today written on the black board. Walking through this garden is an enchantment. You can practice Yoga at the feet of a 15th century monument built during the Lodhis Afghan dynasty. If you look carefully, you’ll probably see some of the birds (dozens of species) living in the park. Residence of the Mughal Emperor for almost two centuries, this city within the city is a must-do. Incredibly red ramparts and magnificent architecture. Every August 15th (Independance day), this is where the Prime Minister hoists the national flag. Concrete slabs lead to the spot where Ghandi was shot in 1948. Visit the Eternal Gandhi Multimedia Museum and the room where the Mahatma lodged, preserved as he left it. Poignant. India Gate is a memorial to the soldiers of the Indian British Army who died in the first world war. It’s also a popular place surrounded by a lawn where locals like to picnic or gather at dusk in summer. Rashtrapati Bhavan or today’s Presidential residence was formerly the residence of the Viceroy when the Indian capital was shifted from Calcutta to Delhi. Quite impressive, it used to be the largest house of a head of state before Turkey got the first position. Blooming in the middle of nowhere, this realistic design Bahai house of worship is one of the most visited in the world. Just a look from the outside is worth the go. It would be a waste to travel all the way to New Delhi and not take the time to visit the Taj Mahal and its surroundings. Agra, city of love, capital of the Mughal Empire has a lot to offer. If you have time, take three hours to go to Fathepur Sikri. It’s possible to fit all this program in one day (leave around 7 and come back around 9). There are daily trains that take less than 3 hours but as mine was cancelled last minute, I’d suggest to rent a car ( 3 hours drive by express way). The Agra fort is less iconic but can be more impressive than the Taj Mahal. It’s huge and represents Mughal style of art and architecture at its best. Plus, it has a wonderful view on the Taj. This palace is located just 600 meters away from the Taj Mahal, on which each of the rooms has a view. The beauty of its architecture is breathtaking, especially on the pool side. Rooms are very very expensive, but a drink at the bar is affordable. Fatehpur Sikri was Mughal Empire’s capital in the late 17th century. It’s unbelievably well preserved and its architecture is incredibly subtle and refined. The charm of the countryside in the heart of Marseille? Bohemian style? Possible at La Passarelle. This Meditteranean restaurant serves healthy and tasty dishes all made with organic products. Vegetable and fruit salad, grilled fish or Kefta in a big garden near a Pétanque playgroung… Here it is. ASK : If they’re open as they close in October when it starts getting too cold. And if they’re not, you can try tapas at their bar L’Alimentation Générale. Plus, there’s a hidden charming little garden hosting events at the back. ASK : Olivier for some tips, where to eat, where to be. He knows the city like the back of his hands. This is too good to be true. Old fashioned but modern. Chic but affordable. The oldest hardware store in France hasn’t aged a day in two centuries. From “savon de Marseille” (soap) to “Pierrot Gourmand lollipops”, here’s where you’ll find everything. Lifestyle paradise. ASK : How to go to “Manufactures françaises” If you’re looking for made in France products only. Part of Maison Empereur, this little shop tucked in Le panier (one of Marseille’s loveliest neighborhoods) offers what’s best. Friendly Christian Qui, former landscape architect has trained 6 months in California and learned cutting techniques in order to become the fish master he is today. So there he goes, working all by himself behind a little bar and transforming the morning’s small-scale fishing products into delicious and creative sashimis from Marseille. Enjoy them in an intimate and relax atmosphere between some Miso soup and oysters. 12 table settings here and dinner only. ASK : To have a look at Christian’s vinyle collection. And let the music play. A visit to Le Corbusier’s “Cité radieuse” is not limited to architecture lovers. Besides the MaMo (art center), the hotel, the restaurant and a bakery, you’ll find another gem at number 318 of this incredible building people of Marseille used to call “la Maison du fada” (the crazy man’s house). In cosy “SEMIS boutique expresso” you can enjoy a cup of coffee, fresh orange juices, cookies and muffins from Coogie coffee shop and buy traditionally knitted pieces from the cool brand “Atelier Semis”. A sweet treat while shopping. ASK : For the home made ice cream… in Marseille. The road that leads to Sormiou is incredible, as you can see Marseille City on one side and the calanque on the other side. This vertigo feeling has a price. In order to go by car (and avoid walking an hour), you need to book a table in one of the two restaurants. Le Château (that I recommend) or Le Lunch (on the beach but not so good). Until October. Les Goudes has an easy access by car. The best way to enjoy this calanque is to rent a sunbed at the restaurant La Baie des Singes (until October). Magical. This multi-label concept store is unlike any other you’ve seen so far in the city. The first thing that crosses your mind is “Where am I?”. Well basically, you’re in Walid Zaazaa’s creative mind, a world where art, architecture and fashion all come together. This French fashion designer has worked with brands like DKNY and Calvin Klein for 15 years before opening what is today the most avant-gardist and coolest store in town. More than half of the brands you’ll find here are new to Singapore. Think Gilet, Inari, Mads Norgaard or Maison Olga… And by coming here, you’d definitely save a shopping trip to Japan, Denmark or France. Zaazaa’s idea is to welcome everyone, “no matter if it’s to buy an affordable postcard, or to get a 300 dollars Maison Kitsuné dress”. That sounds like a lovely Manifesto. ASK : What’s coming up. The store also aims to host events and exhibitions, Daniel Buren for example might come soon. André Chiang, born in Taiwan, had worked under French master Chefs such as Pourcel, Robuchon, Troisgros, Gagnaire… before he decided to settle in Singapore and call his restaurant home. This charming heritage house behind a welcoming little olive tree, takes you on a culinary journey and into André’s creative universe based on an “Octaphilosophy”. Unique, pure, texture, memory, salt, south, artisan and terroir. The result is French, but different. Nouvelle cuisine, but not too much. In this place awarded best restaurant in Singapore, the meat comes from France (4 times a week), and lunch is worth the 100 dollars + you’d spend once in a while (or a lifetime) on a gastronomic restaurant. The daring “veal aspic” basically a deconstructed revamped “tête de veau”, would make you surprizingly ask for more brain, tongue, and other kind of offal you thought you’d never eat. Menu changes daily, but his signature dessert the “Snickers” chocolate bar (new creation each year) remains. The 2015 version is to die for. And when André leaves you a note on a menu sheet saying “Life is about good food, good wine and lots of good friends”, it’s just delectable. ASK: To be seated downstairs to feel the kitchen vibes. So unlikely that a Café called China House is making one of the best tiramisus you could ever eat. I had to go to Georgetown to believe it. What’s awesome about this city is that you can feast on traditional local street food in the night market, then easily enjoy a european sweet treat afterwards. In fact, China House is a cake paradise, and not only a café. 3 heritage buildings converted into 14 spaces (café, restaurants, art galleries, shops, live music…) linked by an open air courtyard. That gives you several possible excuses to go there and get your sugar fix. ASK: For the Tiramisu, of course. “Blue Mansion” or “Cheong Fatt Tze Mansion” is a house that would tell incredible stories if being questionned, well if it could speak. Once the property of Asia’s wealthiest man in the 19th century, it is today one of the most interesting attractions in Penang, an illustration of the best of heritage architecture. A visit to the Blue Mansion throws you deep back in time. A time where Southeast Asia was a promising land, a time when Feng Shui was taken absolutely seriously. I wouldn’t recommend to dine as the food is “so-so” but the tour is a must-do in Penang. Even Catherine Deneuve, for a scene in the movie Indochine has been here. Those in pursuit of true Beauty won’t be disappointed. Sinkeh (“New comer”) is some kind of treasure you’d want to keep secret. But because owner and stage director Chee Sek Thim puts 20% of the benefits into programming, meaning each guest contributes to support the Penang art scene, a hidden gem has to be unveiled. Re-designed to present a contemporary vision to an heritage building, this 19th century straits chinese house, tastefully revamped with wood and concrete, has nine rooms on its 1st and 2nd floor and an art working space on the ground floor. A Library and 2 open patios to chill. It’s rare to love a place so much that you’d come back to a city just for it. Sinkeh is that kind of hotel you can call home. ASK: To meet Sek Thim, among other stories, he’ll tell you why there are silk worm cocoons in glass jars near the entrance. We French people take bistronomy seriously. So when a restaurant, in Singapore, opens and vows to make the best of high-end bistro food with (almost) only asian products, we go like “Ok on verra”. Named after the sweet and sour herb “sorrel”, this restaurant helmed by incredibly young 24 years old executive Chef Johnston Teo has one mantra : “Good food doesn’t have to be complicated”. There are no classic asian or western dishes revamped as the game is to create something new. Think “Edamame & fromage blanc” or “Chicken with white asparagus & oyster mushrooms”. When you miss Europe but still want to eat “local”, here’s a place to go. ASK: To be seated at the bar facing the kitchen to observe and eat. Lunch is affordable but not hearty. Taipei is a creative and inspiring city, a city attached to its chinese roots and influenced by japanese lifestyle.Taipei is actually a city anyone longing for energy and tranquillity could live in. After visiting the Museum of Contemporary Art (MoCA), head to “Si Zhi Tang” for a farm styled lunch. Then walk around the beautiful concrete old factory at Hua Shan Creative Park and have an ice cream at “Café Lumière”. Shop around “VVG”’s charming trendy area before discovering the new upcoming places to be (“Café Showroom”, “Funfuntown”) on Fujin Street. Finish the day and relax at “Wistaria” Tea House and Gallery. No MSG guaranteed. This lovely vintage bucolic restaurant is the place to be if you have no time to explore Taipei’s countryside. Well, at least you’ll get a taste of it. Fresh Fig and Chicken salad, stir fried veggie with okra and Taiwanese ham or with cauliflower and Tofu, Chilli pepper stewed chicken with glass noodles. Fresh produce of course. Hearty meal. Imagine a city within the city, a wine factory abandoned and revamped to host Taipei’s primary creative arts center and dozens and dozens of shops and design restaurants. And a cinema, where you could watch french movies (well Ok with chinese subtitles) and a Café where you would daydream and eat home made ice cream. Hua Shan 1914 creative park is the Taiwanese version of parisian “Cour Saint-Emilion”. But better. VVG, which stands for Very Very Good, started what is today a lifestyle empire with a small restaurant fifteen years ago. Today spreading their “Good living” mantra, via their bistro, bakery, shops, (high end) Bed & Breakfast… And creating in a busy city a calm environment with american, european and japanese influence. You could spend hours chilling and visiting VVG’s branches, but I’d recommend you focus on VVG Something, their library (awarded one of the 20th most beautiful in the world), and VVG Chiffon (tableware and lifestyle products, think Merchant Mills, La savonnerie Bruxelloise…), both facing each other next to VVG Bakery and VVG Bistro located in a charmingly trendy area. This beautiful spot, popular among the taiwanese artists community is as it says a café, and a showroom. After a look at the exhibition (that would be a quick one considering the little space) seat down and enjoy a hazelnut latte before exploring Fujin Street, the new street to be in Taipei. Trendy and chic. Alert! Coolest homeware shop in town. ASK: For the lamps from Asian Scandinavian designer “Chen Karlsson”, the “Landscape” organizer from taiwanese brand “Danzo Studio”, wooden pen and stag horn shaped light from Mozidozen. So unique.